Some genetic traits help an animal to live longer. These are called “Self Selection” traits. Self Selection traits may not care about finding a mate, making babies or altruism. Have you heard of rats eating their pup when they are hungry? It is the rat’s self-selection trait in action. Some biological traits help an animal to secure better quality/quantity mates. These are called Sexual Selection traits. These traits may or may not care if an animal lives longer or if its community flourishes. A good example of Sexual Selection trait is peacock’s tail feathers. Luxurious tail feathers in a peacock advertises that the animal is physically/genetically fit. Tail feathers don’t increase the survival of the peacock. If anything, the long tail only makes it difficult for the peacock to catch its prey or run/fly away from the predators. Tail feathers are also metabolically expensive to maintain. A lesser peacock can’t fake a nice, long and iridescent tail. So, peacock’s tail feather is what we call a honest signal. If the peahen selects a mate for its luxurious tail feather, the peahen can be sure that it selected a genetically superior male. The genetic trait in a peacock to grow a beautiful tail feather is a sexual selection trait. The genetic trait in a peahen to find such a tail feather beautiful is also a sexual selection trait. These traits do not help the animal to catch a prey or save the life of an amigo. Their only purpose is to help the animal to make more healthy babies. Study of Sexual Selection forces is full of politically unacceptable conclusions. This area is not as well studied as it must be. Even the researchers who study Sexual Selection publish their findings with caution. Even very little published insights are not adequately communicated to the public. Group Selection traits are hotly disputed by some scientists. But we will never understand who we really are without understanding the effect of Group Selection traits. They help the community (in which an animal lives) to flourish and sustain. They may not care about how long an animal lives or how many babies it has. Our willingness to go to war for our country is a good example of a group selection trait. When someone goes to war, they risk their life. They are working against self-selection interest. Someone who goes to war and dies can’t have any more children. They also risk the future of the children they already have. There by, they work against the sexual selection interests as well. Consider two prehistoric societies, Y and N. Society-Y was made up of ‘brave’ people, who were ever ready to go to war on behalf of their society/country. Whereas members of Society-N were ‘cowards’, who were quite unwilling to risk their life by going to a war. When Society-Y went to war with Society-N, Y probably decimated N. With time, genetic traits of Society-N was wiped off from the planet of earth. The ones left behind, Society-Y, are all willing to die for their society. A part of 'the group that we live in' lives inside each one of us. At one level, each one of us is the group. We act in a way that subjugates the interest of other people to the common good of the group. We willingly sacrifice some of our own self interest in the alter of the common good. How much of self interest we sacrifice, or how much of similar sacrifice we demand from others, changes based on the situation we are in. Our sense of group identity and altruism are elastic. In an individual, selection forces express themselves as emotions/feelings. Self Selection may express itself as hunger, fear, cold, warmth, satiety, anger, etc. Sexual Selection may express itself as pride, libido, competitiveness, creativity, etc. But the way we feel the Group Selection is interesting. The sense of oneness we feel when you stand in front of God is how the Group Selection feels. When we feel the forces of Group Selection, we have a strong urge to merge and lose the sense of one’s self into the identify of the group. 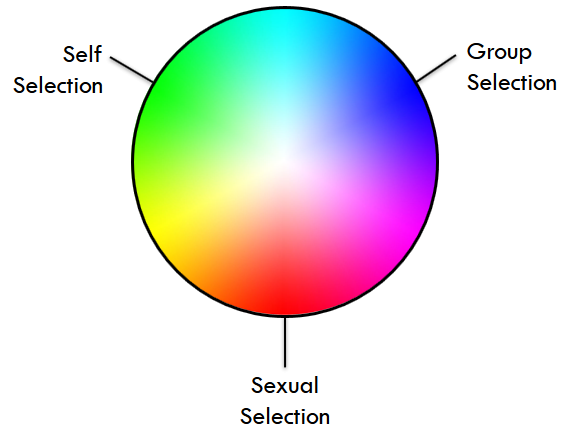 Emotions of Group Selection are just as seductive, if not more, as the emotions of Me Selection or Sexual Selection. Though, we don’t readily recognize it. The interplay of the three selection forces determines who we are and how our societies are made. 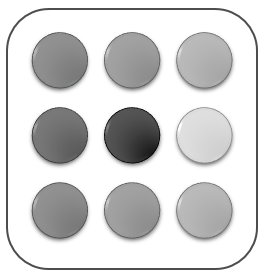 Some of our traits are fostered by two or three different selection forces. For example, having a broad shoulder and good shoulder muscles in a man helps him to be a good hunter (Self Selection). It also helps him to find more/better mates (Sexual Selection). Being a good hunter, while it caters to Self Selection forces, sharing the spoils with the group also caters to the Group Selection forces. When a particular trait is exclusive to a single selection force, expression of that trait might be opposed by other forces. For example, human equivalent of peacock’s tail feather (sexual selection) is often considered as vanity and looked down upon by the society (group selection). Our natural desires and urges are endless and shifting inter-play of the three selection forces that played a part in molding us. At any given point in time, your natural feelings are just a pixel on the color wheel. At times, you play near the edges. At times, you play right at the center. Life becomes gets uncomplicated when you understand the color wheel of selection forces and then design your life around that understanding. 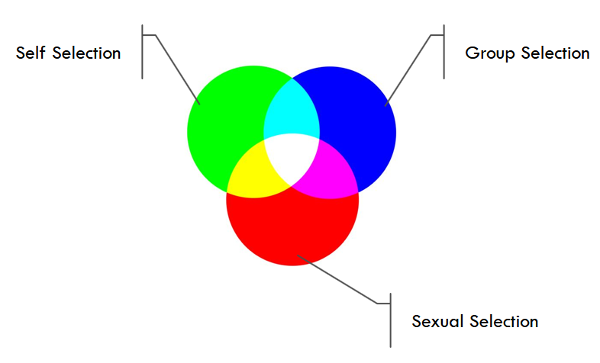 Life in a color wheel might be the simplest answer to so many of your life’s dilemmas. In the future posts, let’s take a closer look at the inter-play of these hues. I promise you, it will be nothing less than liberating.